16" x 12" stretched canvas in oils. 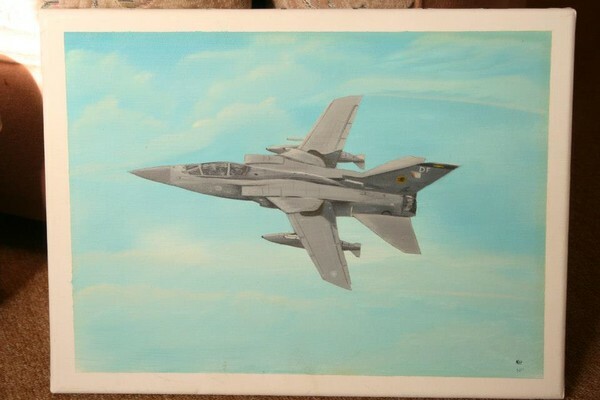 This depicts an RAF Tornado F3, this was the first of my first attempt at aviation art. Let me see... a Tornado is shorter than a Jaguar and has bigger augmentor nozzles. For some reason I just couldn't immediately dismiss a Flogger as I walked up to it with it's outrigger landing gear and a nozzle so big it could have been two at the aspect I had. Here in America the swing wing passed easy with the Aardvark and really hard with the Tomcat. Artist Reply: Thanks Joanie. I still have this one as it was the first and it shows me how much I`ve improved (or I believe I have).